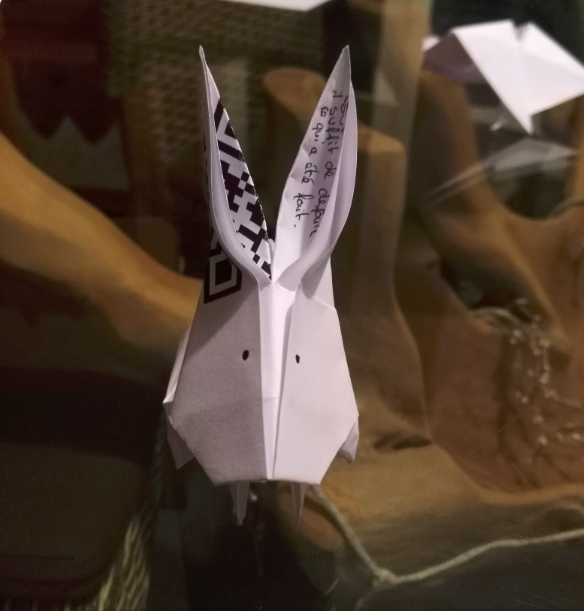 I'm offering someone an origami (rabbit shape) with a QR code written inside. This is the beginning of a series of riddles. My question is, how could I make the person I'm offering the origami to understand she must open up the folding? What kind of sentence could I write aside the present so she would think about unfolding (so destroying) the present I gave her? In a not too obvious manner obviously. I've mixed up some of your idea and here's what I've ended up with ! C'est ici que tout commence, il suffit de défaire ce qui a été fait. You are really creative and there's is a lot of interesting ideas I'll keep aside (especially the "For stories untold, watch this one unfold" from @bass), thanks for all your replies guys. You could have a small part of the QR code visible on the folded origami. Just small enough that it's not immediately obvious what it is at first. "To understand something, sometimes we have to trace back to the first step that started it all." "It all starts at the first fold..."
this may be too obvious... Depending on how well you know the person, you are possibly the best person to put together a sentence with enough in it to convince them without telling them what to do. As op mentions they want to write this on something (not necessarily the gift/origami)? So it may be okay to have a little length to it, perhaps a simple play on words. An alternative idea may be along the lines of one of the other answers. Perhaps a drawing of something that points or goes into the final fold, this could be paired with some text to give the recipient an idea to unfold it and look inside the final fold. Make the origami object be a box, which seems to contain a "real" present. Other origami designers have published more ornamental boxes, which also encourage opening. Many of them have separate pieces or assemblies for a lid and a main container. Tomoko Fuse is famous for such models. Write the word "imagiro". In other words, reverse the origami. You could glue the end of a thread next to the QR code, fold the rabbit and let a bit of thread jut out from somewhere strange (i.e. not the top, it could be mistaken for a hook). This will look out of place and beg for an unfolding to see what it's about. Let's go one step further this time. I'll still have 8 left. Joker makeup is optional. Applying the proverb "Curiosity killed the cat" literally would leave the origami cat with 8 out of 9 lives left, and the QR code visible. You can let an enigm as : "White Rabbit loves play cards but... But it's an hungry rabbit Where are the clubs... ?" You could just write the word "Aphrodite" on it as a clue that the answer is at the rabbit's "heart" as in center. You could make the origami out of money and instruct them to by themself some coffee or something with it (so they don't feel bad about unfolding it). I have an idea that would require some more work, but it would probably pay off in terms of being interesting to solve. You might include a riddle that, in and of itself, is completely unrelated to the origami. However, that riddle is the beginning of a side trail that leads to a Burr puzzle. Only you, knowing your friend, can judge how difficult the Burr puzzle should be, however it's important that the Burr puzzle has a distinctive shape. I'll present the further steps at the example of the PicassoTiles Barrel Burr puzzle, which can be found in this bundle and has instructions here. Anyway, when unassembled, writing would become visible in the inside of the barrel's tiles. When the pieces are put next to each other in the right way (if put next to each other wrong the result wouldn't make any sense, as in literally not proper text), the writing would read "The rabbit and the barrel... More alike than they seem...", which should bring your friend on the track to do the same with the rabbit as she did with the barrel, i.e. disassemble (unfold) it to find a clue inside. How about labeling the folds in reverse? So the receiver gets the origami and sees an arrow and a number 1. They open that fold and see an arrow and 2, etc. I'm imagining this because, if I were given origami, I would be reluctant to open it for fear that I could never get it back to the right shape. If there is a series of arrows and numbers pointing into the origami folds, I feel like I might be able to redo it after opening it. "Find the carrot." -- a clue that they need to look for what's inside the rabbit (i.e., what it's eaten). Not the answer you're looking for? Browse other questions tagged puzzle-creation paper-folding or ask your own question. How to create a fun puzzle? How would one make a good liars puzzle?